Google has a corporate philosophy -- "Do No Evil" which, on the face of it, sounds great. 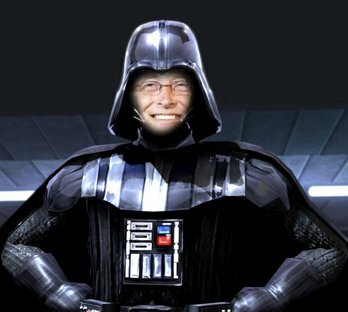 "Do No Evil" lets Google say, "At least we aren't Microsoft," which has been called the "Evil Empire" so often we've come to expect seeing Bill Gates as Darth Vader. But "evil" and "harm" are two different things. Like Gulliver accidentally destroying a Lilliputian farmer's field simply by sitting down, Google can wreak havoc without knowing it. Take the way they've helped Spammers lately. Yes, I say "helped" albeit unintentionally by automatically downloading images with email on the Android. You see, spammers send emails to random addresses -- a lot of those addresses bounce back because, well, they're random, and therefore not real. One of the ways they find out if your email address is a real email address is to have a picture in the email. When that picture gets downloaded, they learn all sorts of things about you... your operating system, where you are in the world, what kind of email client you're using, and, most importantly, that you open spam messages. That makes your email address more valuable and they sell your address to other spammers, and you get more spam. The touch screen isn't always the most accurate interface, or maybe I've just got fat fingers. So, when I'm trying to just hit the check-box on my email so I can delete it, I sometimes accidentally open it, and then the email program goes and tells the spammer I'm a real person. The last time my phone updated itself, they changed it so now I have to tap "Download HTML messages," which is kind of like Gulliver saying, "Oops, sorry," and getting off the farmer's crops. It was a simple error, but because there are over 100 million Android devices out there, it affected a LOT of people. So, while Google didn't intentionally do evil, a simple oversight, affecting over 100 million people had evil consequences. And that's when they weren't trying to justify doing something they really want to do but might be just a teensy evil. And when they do that, watch out.